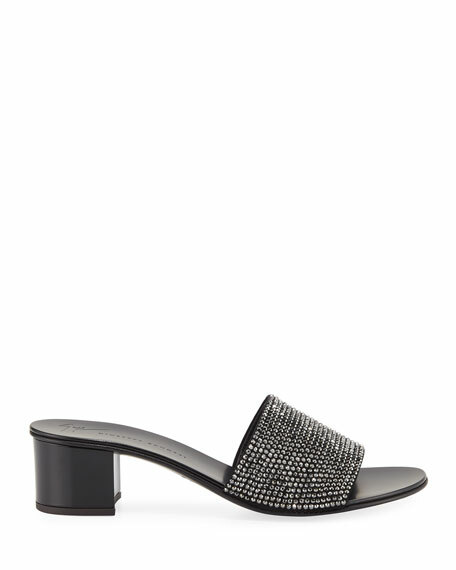 Donald J Pliner leather slide sandal with jeweled buckle accents. 1.8" platform wedge heel. Open toe. Three-band belted upper. Molded footbed. Manmade outsole. Imported. EXCLUSIVELY AT NEIMAN MARCUS Rene Caovilla satin and crystal mule sandal with metallic snakeskin accents. 4.1" covered heel. Open toe. 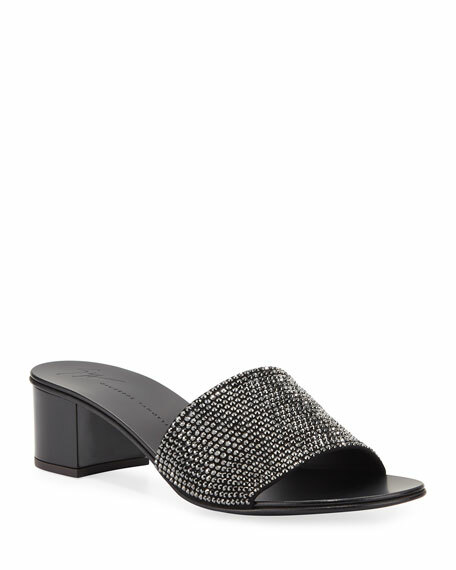 EXCLUSIVELY AT NEIMAN MARCUS Rene Caovilla satin and crystal mule sandal with metallic snakeskin accents. 4.1" covered heel. Open toe. Cutout vamp. Slide style. Leather lining. Signature glittered outsole. Made in Italy.